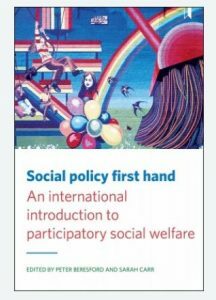 Written by Sarah Carr and Peter Beresford, Social Policy First Hand is the first comprehensive international social policy text from a participatory perspective. It presents a new service user-led social policy that addresses the current challenges in welfare provision. A companion volume to ‘All our welfare’, it introduces the voices of different groups of service users, starting from their lived experience.